From Bryce Coward, CFA: Third quarter real GDP came in at a 3.5% QoQ annualized rate for the third quarter, above expectations for a 3.3% growth rate. The growth rate itself wasn’t much of a surprise, and frankly, neither were the drivers of growth. But, the report is reminder of a GDP report that was, to some extent, manufactured by trade war concerns and late cycle fiscal stimulus. 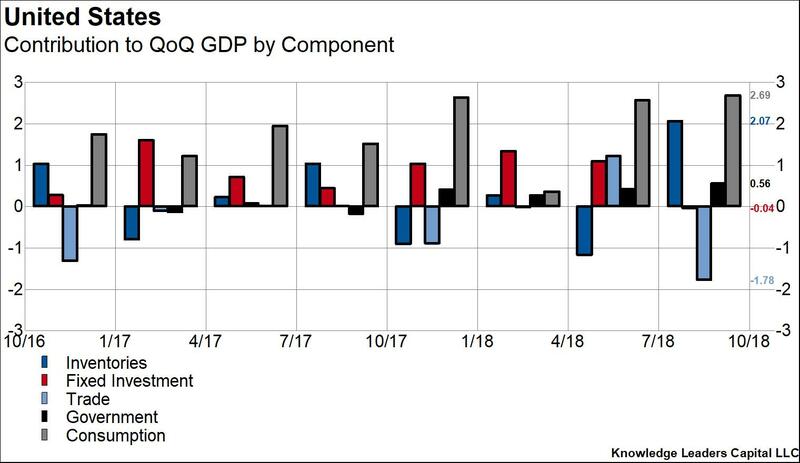 In the first chart below we show the components of QoQ annualized GDP growth for the last two years. We see that in the most recent quarter personal consumption (grey column), inventories (dark blue column) and government consumption (black column) all added to GDP growth while trade (light blue column) and fixed investment (red column) both subtracted from growth. In deconstructing GDP growth, we observe that trade was unusually weak (imports outpaced exports by a wide margin) and inventory growth was unusually strong. Inventories often flip from being a drag on growth to adding to growth whereas trade is typically a small to moderate drag on growth. Both inventories and trade were affected by domestic companies bringing forward imports to avoid higher duties once tariffs on half of Chinese imports rise to 25% at the end of the year. 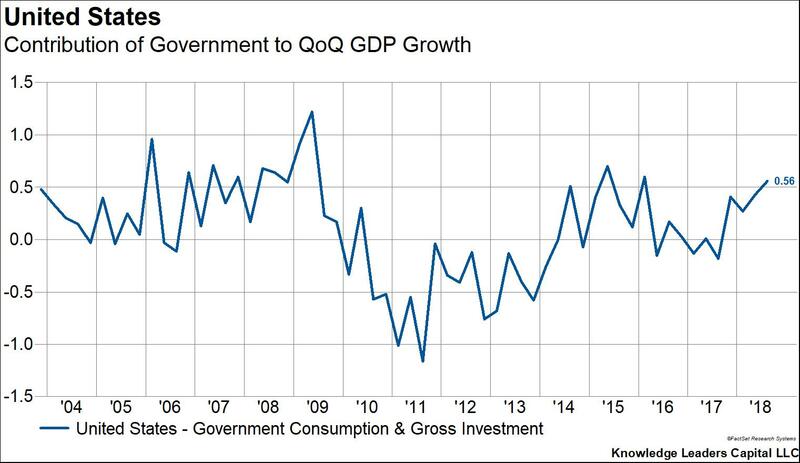 We also observe government spending adding .56% to GDP growth, consistent with the rate of change in fiscal stimulus peaking right about now. The next chart shows the contribution of inventories to GDP growth going back 15 years. 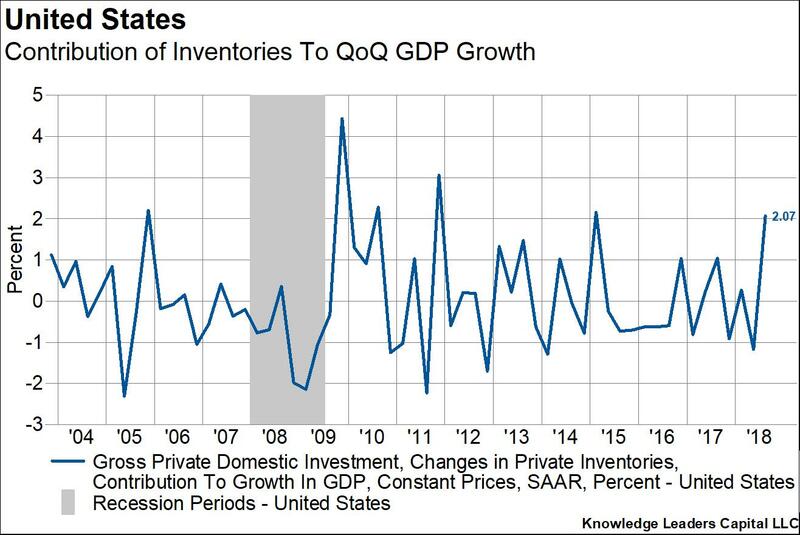 As we can see, inventories added the most to GDP since 1Q15, 4Q11 and 4Q09. In contrast to today, growth was recovering from weak quarters in each of those instances. In none of those instances did inventory builds continue. The final chart shows government’s contribution to GDP growth for the last 15 years. The reading of .56 is one of the highest in recent history. Usually, high contributions by government to GDP are followed by low or negative readings as fiscal stimulus turns to fiscal drag. We aren’t there yet, but neither will government spending continue to contribute 56bps to GDP growth. After all, stimulus in 2018 will be add 1.2% to GDP growth and only .4% in 2019. The question is, where is the signal in all this? Certainly GDP was juiced by inventory building ahead of higher tariff rates and government spending. But trade was also an unusually large drag. It’s not outlandish to assume that inventories and trade will net each other out over time as the anomaly is corrected. Government’s contribution to growth is not likely to continue at current rates and will eventually turn to a drag in the quarters to come. Consumption was quite strong, but domestic fixed investment was quite weak. Here we need to be careful. A portion of consumption’s outsize contribution to growth may well have been tax related and thus not likely to continue. This is especially true since higher interest rates on consumer loans and mortgages will subtract from disposable personal income starting now and continuing into 2019. Therefore, for the net of consumption and fixed investment to remain strong, fixed investment must sustainably accelerate as a result of capex incentives in the tax bill. The iShares S&P 500 Index ETF (IVV) rose $2.54 (+0.95%) in premarket trading Monday. Year-to-date, IVV has declined -0.20%.